My Thoughts on a "Capsule Wardrobe"
I write to you from my fiancés' parents house in chilly New York. I'm currently in the midst of a 12 day trip to 3 different places, and decided to film a video on what I packed. I love watching people's packing videos; how they organize and choose pieces for where they are going, so I thought I would share mine with you. Attempt to pack in a carry on. Pack as minimalisticly as possible while still having everything I need. Watch the video if you want to see exactly how I packed these items, as well as what beauty items and accessories I packed! Would you guys like to see a more detailed blog post on the makeup shown in this video and my reasoning for choosing it? 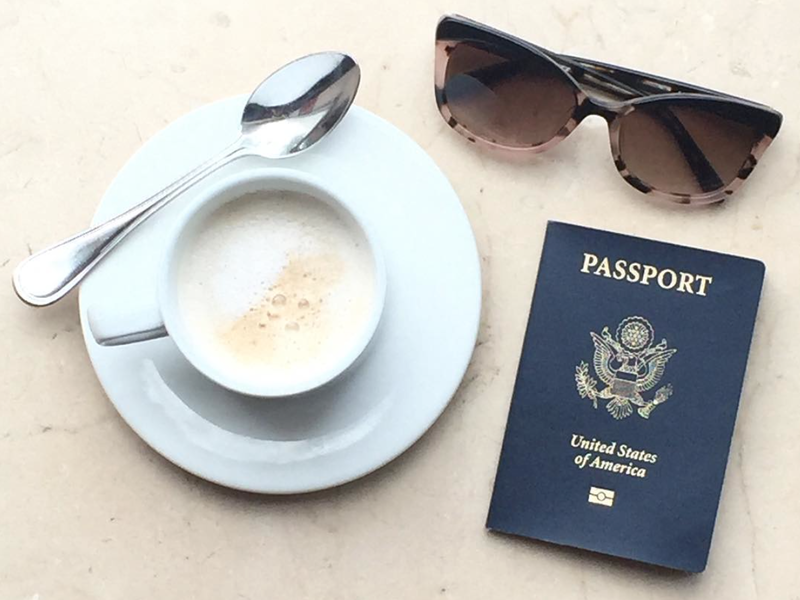 Would you have packed any differently? Also, if you want to watch my trip, I am daily vlogging! Watch the playlist here. Late last night I got back from Punta Cana, exhausted from the trip but with this fiery need to declutter my closet. Alex promptly fell asleep, but I decided to take my laptop into my closet and watch an episode of Girls while filling up an extra large trash bag with clothing to donate. One episode turned to three, and one trash bag turned to two, until I was knee deep (literally and figuratively) in piles of clothing. I haven't done a real, intense, wardrobe cull in a very very long time. In fact, I'm not sure I have ever done this kind of cull... where I really take the principles of Marie Kondo's "Life Changing Magic of Tidying Up" to heart and touch each and every item in my quest to see which one brings me happiness. My plan isn't to declutter just for the sake of the minimalism trend, I want to make that clear. Trends come and go. When I first started on YouTube, the trend was for huge collections of makeup and clothing, the trend was to have stuff. Right now, minimalism is sweeping the blog world, encouraging everyone to cut back. So it makes me wonder... maybe minimalism isn't trendy right now just for trends sake; maybe there is a need that naturally comes as a balance to the consumerism of the past decade. Having a lot of stuff around all the time can weigh you down, both literally and figuratively. I'm not planning on having a one drawer makeup collection or one rack of clothing, I like these items too much. But this whole "holding onto everything" isn't doing anyone any good. If it doesn't bring me happiness, it needs to go. So that's where we are at. Normally when I feel like decluttering my closet I quickly sweep through the racks, pulling the really obvious pieces and putting them in a pile to try on one last time. In the past, I have been left with 10-20 items (at MOST) that I then take to a full length mirror and try on, one by one. Out of these pieces, I normally only end up letting go of half, as the others I convince myself to keep for various reasons. This time I decided to take a different approach. Instead of pulling the obvious no's, I pulled only the obvious yes's. I sorted through my racks, pulling only the items that stood out as my absolute favorites, and in the end I was left with a rather meager 10% of the whole closet. 10%? I only love 10% of my clothing? I then realized something. I don't tend to shop a lot (for clothing) so I like to hold onto everything I do buy, because I only really buy clothing pieces I love. I have held onto pieces of clothing that are at least 5 years old, because they still fit me and I loved them 5 years ago, but I never wear them anymore because they no longer fit into my life. I found a lot of little sequin dresses, studded jeans, rhinestone jeans, stuff that I loved when I first moved to LA and these things were trendy, but they aren't anymore, and even if they were, do I feel like the type of person who would wear rhinestone jeans? No. And on that note, let's say rhinestone jeans did come back into style, and I decided I needed a pair. Would I really want to wear my pair from 5 years ago that maybe hits the style slightly off of the head? Back then the rhinestones were on the pockets, what if the new trend is rhinestones around the belt loops? You guys, this is a very strange example and I cannot say I would ever be down with a trend of "rhinestones on the belt loops", but I am trying to explain the best I can my thought process on getting rid of these old beloved items. I also don't want to come across as someone who follows every fashion trend (as I actually end to stick to the same kind of clothing vibe), but I do feel like this kind of thought process might be helpful to others trying to cull their closets. You don't need to keep something that you loved 5 years, was super trendy 5 years ago, and you felt super hot in 5 years ago. If that trendy item comes back into style, and you feel you need it, treat yourself to a new pair. Chances are, it's not going to come back into style in a way that you feel you need to try again, but if it does, c'est la vie. After pulling my absolute favorites from the closet, I was left with about 90%. I took my favorites and put them outside of the closet so that I wouldn't have to look through those clothes again, as I knew I was keeping them. From there, I decided to do a run of absolute no's. I was able to pull about 20% of my closet for this category, and I decided to not try anything on. If I felt that strongly that the item was a "no" and not a "maybe", it needed to go. In the past, I have tried every no back on, and ended up keeping half... but not because I accidentally forgot it was a treasure. I would simply convince myself to keep the items and then they would never get worn. These no's needed to go. The no's were put directly into a trash bag to donate, and taken out of the closet. Now I was left with approximately 70% of my wardrobe... the maybe's. I knew the maybe's would be the hard ones, and the ones that were going to take the longest to go through. I have decided to do this pile in steps, over the course of several days. I still had a little bit of energy left in me so I pulled maybe 10 more items, stuck them in the donate bags, and cleaned up for the night. I'm going to leave my closet for a few days and then come back to it with fresh, new eyes. I'll keep you guys posted! Ok so I know the idea of the "capsule wardrobe" is nothing new... it's been around forever and came back into the fashion blog world a couple of years ago so I am very behind, I know, I know. I've known about this for about a year and kinda tried to implement the idea in my mind (the first step to anything is getting your mind 'round it) and kinda sorta kinda started it kinda with my makeup sorta. And by that I mean the intent was there but it didn't really work out. I'm someone who loves the idea of minimalism but loves the reality of having stuff. And it's SO frustrating. I fully believe that stuff equals stress and if you have less stuff overall and love every piece you are a happier person. I believe this. Fully. If you haven't read "The Life-Changing Magic of Tidying Up" by Marie Kondo I highly recommend it, and it will explain this idea in a more fully formed manner. If you aren't familiar with the idea of a capsule wardrobe, it's essentially this: you have 30 or 40 pieces of clothing total (including shoes and bags but not workout clothes and undies or something like that?) that are all classic, timeless pieces that mix and match. The idea behind this is that you will spend way less time in the morning getting dressed but still look amazing in anything you put on. You life is less cluttered, your morning more streamlined, and you will look great everyday without even trying. Here's the thing. I have a massive closet full of lots and lots of clothing. Everything fits me, and everything has been in style in at least the last 3 years (lol). That sounds amazing right? But, almost all of the pieces (except the shoes and bags) are "fast fashion" pieces from places like Forever21 that really aren't classic. None of them go together; this idea of mixing and matching just doesn't apply to my closet. Most of it is bright and patterned, which again, doesn't bode well for mixing, and lots of them only can be worn with one other piece or follow a really specific trend that isn't easy to wear. Out of my entire closet, only 10% of them could be considered classic pieces, and I only wear about 20% of the stuff in there. That being said, every time I go in there to purge pieces I get stuck. I like every single thing! I don't want to get rid of anything! If I were the type of person who could wake up every morning and go in there and come out in a kooky outfit full of pieces that I love but maybe don't really go together, I would say, "That's fine! I'll keep the lot!" but I'm not. Most days I would rather wear my yoga pants or sweats all day rather than deal with my closet and trying to match things that will never match. Having too much stuff complicates your life in ways you don't even realize until you really sit down and think about it. 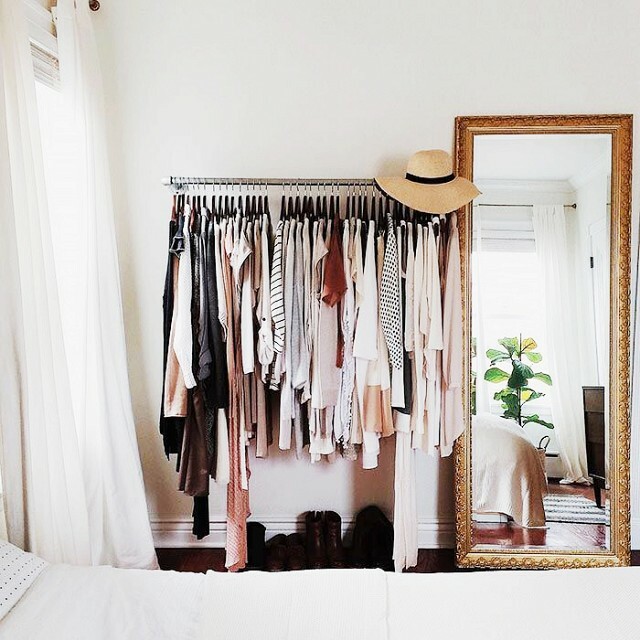 Do you ever feel like you have nothing to wear even though you have a bursting closet? I feel like that is every girl right there, but it doesn't have to be that way. Alex pretty much wears the exact same thing every day. He has a few pairs of jeans, a few V-neck solid fitted tees, and a few pairs of shoes. He has a couple leather jackets and a couple sporty ones, and 2 watches, a black and a silver. Alex literally has the definition is a capsule wardrobe and doesn't even know it, cause he is a guy and guys are just like that. He literally always looks good. It takes him 2 minutes to put on his clothes and it always looks put together and polished. Realistically, I am not going to become a full blown minimalist with only 33 pieces of clothing and 1 drawer of makeup, that's just not me. Having said that, I think that paring down until I get to a manageable place is really important. It's not about purging just for the sake of doing it, it's more a "feeling". My feeling for doing this comes from the need to un-complicate my closet enough for me to feel like I can walk in there and put a classic outfit together in literally 2 minutes. I read this article on a blog somewhere that really stuck out to me. She said something like, "I want to have the type of wardrobe that I could pack on a moments notice in one suitcase and jet off to Europe." 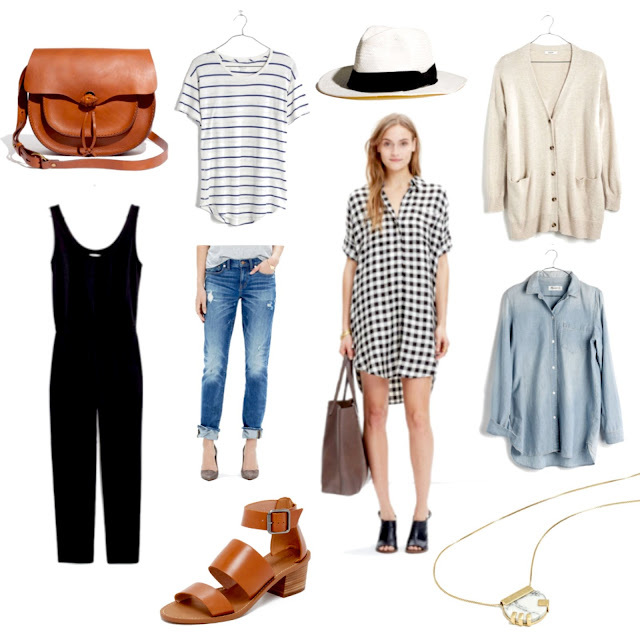 That is the perfect summation of a capsule wardrobe. I am majorly crushing on French inspired capsule wardrobes. The French really have fashion down. They have 3-5 classic, expensive pieces that they mix and match with other classic neutrals and literally always look chic. I haven't bought new clothes (with the exception of my latest Abercrombie Haul) in over a year. I'm not a shopaholic (with clothes... makeup is a different story! ), I don't go to the mall every weekend to pick up new stuff, but I decided to treat myself to a new clothing haul. 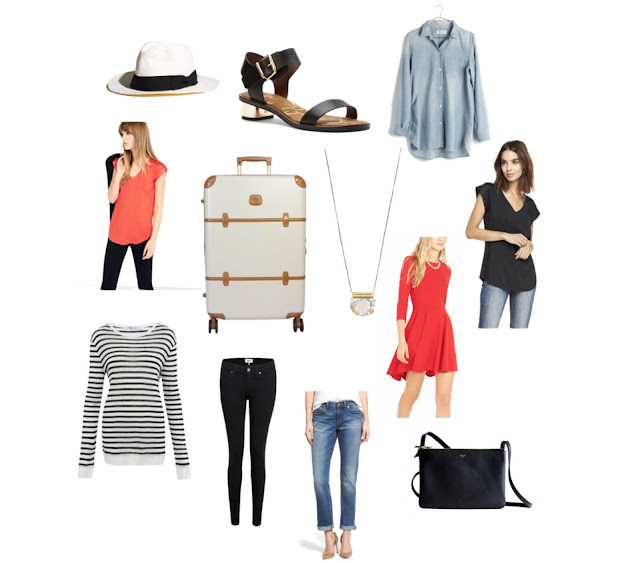 My mission was as follows: I was allowed to purchase only things that would fit into my "French Capsule Wardrobe" theme. They had to be neutral, not because I hate color, but because my current closet is bursting with color and that is part of the problem. I wanted classic and preppy pieces that would see me into summer, and even though it pained me, Forever21 and other fast fashion sites were not allowed. Part of the whole capsule wardrobe movement involves buying more expensive pieces that will last a long time. I want to be able to "wear the crap" out of these pieces until they are worn in and loved and you can feel the memories and places it has been. This is the complete opposite of my current clothing situation, where most of my shirts have been worn only a handful of times because they are so trendy or bright or hard to pull off that you really can't wear them more than a handful of times. Overall I am really happy with my selections, and plan to use this as encouragement to get rid of some of my bright pieces that will never get worn again. For every piece of bought (including those Abercrombie pieces from before) I am going to select one piece of donate. I'll keep you guys updated on my progress! Do any of you follow the French wardrobe lifestyle? What are your key pieces that you base all of your other outfits on? You guys may notice that my blog just got a makeover... my insomnia is acting up big time, so I've spent the last 2 hours binge watching season 4 of Girls and redoing my blog theme. I'm aware that some of you might miss the old theme (or is it just me?) because I already miss it, but I needed a change. As gorgeous as I felt the old one was, it felt too cluttered, and I really do need to aim on streamlining my life a bit, so here we are! I like it. I might get bored with it, who knows. But for now, right in this moment, I love it. It feels clean and new. So yay to productive insomnia sessions yippee! It's raining here in Punta Cana, so instead of being in the pool with a Pina Colada I am here, tap tap tapping away at my laptop. For the past week I have been trying a new eyelash combination and thought I would share my thoughts with you. I've had eyelash extensions on and off (mostly on) for about a year now, but my very last one has fallen off on this trip, so I have been trying these two lash products on my bare lashes (as one should). The products in question? The new L'oreal Voluminous Superstar Mascara and the Milani Length in Seconds Lash Extension Fibers. So... yeah, lash primers are weird for me and something I am never sure is worth it. My thoughts overall on this mascara? I like the mascara side, but I'm not sure it's QUITE as good as just the original voluminous mascara, and I'm overall unsure about primers. While this is an OK mascara and there is nothing wrong with it, it's not one I would repurchase again only because it's not more than ok.
Moving on to the lash fibers. These are not the first lash fibers I have tried, but I was curious about this one in particular because you buy this tube separately and not alongside any particular mascara, which means you can use any mascara you want. 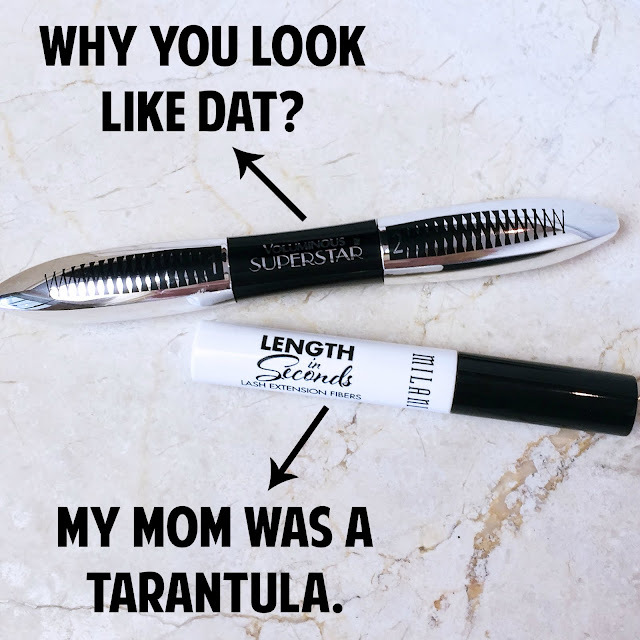 Most fibers I have seen are packaged along with a mascara you are meant to use with it, and I am picky about my mascaras. These fibers are meant to be applied to your wet lash tips after the application of a coat of mascara, and then covered with another coat of mascara. Here's the thing though... lash fibers literally make your lashes look like furry tarantula's legs. They DO make your lashes look bigger but they do so by kinda clinging onto your lashes like little baby furs (which essentially, they are) and if you look closely they look furry. I feel that this is a very odd look and it throws me off when I try to use products like this. That being said, I continue to use them because I would rather have furry lashes than no lashes at all which is essentially what I look like when I am wearing just a base of mascara and that's it. Overall... I'm unsure about the fibers. I don't hate them, and they definitely do work, I'm just not sure of the end result. For now, I will keep using them, but I will do so knowing that furry spider legs are the result (and that's ok). What do you guys think about primers and fibers? Have you found a secret combination that just works? The weirdest thing happened just now. I'm sitting here, in my hotel room, on a family vacation in Punta Cana, and I got this overwhelming urge to write a blog post. Hello my name is Elle Fowler and it has been 10 months since my last post. And I stole the above picture from Blair's Instagram. I just wanted to chat really, about makeup and life. In the last 10 months I have healed from a broken back, gotten engaged, bought and moved into my first house, started a new company, planned a summer wedding, and gotten a second cat (lol). It's been busy, and wonderful, but what it has not been is productive on the makeup front, and that means both for videos and blogs. I think I have been a bit overwhelmed with my "outside of YouTube" life. You guys know that makeup and YouTube stuff was always a hobby first and a job second, and I really struggle with it when I don't feel particularly inspired. Recently I've been a bit bored with it, to be honest. I feel that everyone creates the same videos over and over, and I find that when I am bored with other people's videos it makes me bored with my own. Couple being bored with videos with the fact that my life outside of YouTube has been busy and you get what you have right now... a stagnant "in-between" phase. I went to the drugstore the other day and just stood in the makeup aisle in a silent fervent haze and I realized... man, I still LOVE makeup. It gives me butterflies to look at all the new products and then take them home and play with them. I love researching them and swatching the colors and textures, always convinced that I will find something better than the last, always convinced something new will be a future holy grail of mine. "What if this is the foundation I wear on my wedding day and I don't even know it yet?!" Skincare is the same, and body products too; all of it makes me genuinely happy. The promise of a new result, the rush of giddiness trying it for the first time, it's the best. I'll tell you this - when I spend time and happiness creating a video full of stuff I love (like a favorites video) and then every single comment talks about the video being sponsored (when it's not) it really just kinda kicks that happy bubble of a feeling. It pokes the bubble. The bubble is poked, it bursts, and then I'm sitting there like... ok hmm wait where is that happy bubble? Hello... bubble. Come back. It makes me want to buy products and play with them and keep the happy bubble to myself. I'm not even complaining really, I think it's the community as a whole. The YouTube beauty community is not what it once was in terms of feeling like a community. Right now it feels like a bunch of skeptics watching a bunch of girls try to convince people to buy something they are being paid to sell. It's just turned into something weird, all around. But then there's me. I've been around the beauty community since the beginning, since before most people who watch it today were watching, and I'm still here loving on the same things I loved on then. I'm 8 years older, and in a much different place in my life, and I still get the exact same feeling when I walk into a makeup aisle. I'm not even really sure. I'm not saying bye to YouTube, my channel is my baby... but I'm in a weird place right now. Maybe I'll start blogging? There are certain blogs that still give me that feeling of community that a YouTube channel doesn't anymore. I would love to create that here. You know that one thing that you find it impossible to pass up spending money on? It might be an expensive coffee shop, or a rare bookstore, or a regular mani down your street, but whatever it is, I feel that all of us have one "splurge" that we know we could go without but we do it anyway, every time. For me, it's massages when I'm on vacation. I know, I know. But listen, there are a ton of health benefits to regular massages in addition to it making you feel loose as a goose (but I wouldn't recommend getting drunk afterwards). Sometimes I'll get a pedicure, or a facial, but honestly, 99% of the time I will opt for a massage. Massages have many health benefits such as reduced muscle tension, improved circulation, stimulation of the lymphatic system, reduced stress, increased joint mobility and flexibility, heightened mental alertness, improved skin tone, and reduced anxiety and depression. They can also help with back pain (check), chronic pain (check), and insomnia (check check check) so... yeah. I love them. All that science stuff aside, I love the way they make me feel, so here I am, at the Hard Rock Punta Cana, and I have decided to start a new series called "Spa Treatments and What I Thought" (a working title). Here we go. Official Description: Restore your vital energy with this full body massage. Let the tension and stress disappear on contact. This massage provides a wonderful sense of well-being, as it improves circulation, relaxes muscles, and stimulates the lymphatic system. Thoughts: This was basically a Swedish massage with a little bit of Lomi-Lomi thrown in. Normally I'm a bit more "adventurous" with my massages, and will select one that looks unique to that particular spa, but my mom booked these as a mother/daughter thing, and regardless of its plainness it was wonderful. The spa itself is huge, definitely one of the largest ones I have ever visited, and was underground (don't you know all the best spas are?) so it was very dark and cave-like. And massive, did I mention that? I actually got lost trying to find the entrance, and then lost again trying to find the locker area, and then I just kinda stood there like a bump on a log waiting for someone to tell me where to go... I think finally someone took pity on me and led me about a mile underground, past many a pool, past many a waterfall, to my room. Oh, and you aren't allowed to have anything with you, even your phone, but being the rebel I am I snuck mine in my pocket and then was too nervous to use it so I just sat there hoping it wouldn't vibrate. Lol. Would I recommend? : Yes, the spa is gorgeous and the treatment was totally relaxing. I'm curious... what's your "one thing"?